EODID Athens Mediation & Arbitration Organization was founded on the initiative of Nomiki Bibliothiki Publishing Group (www.nb.org) and a team of prominent Judges (retired), Academics and Lawyers, with the exclusive purpose of providing mediation and arbitration services in Greece and abroad. 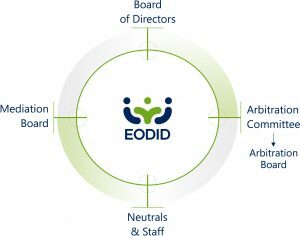 Incorporated as a société anonyme under Greek law in March 2016, EODID Athens is assisted in its work by a Supervisory Board and an Arbitration Board, whose broad scope and increased decision-making powers enhance the integrity, reliability and quality of EODID services. Regarding arbitration hosting in particular, EODID Athens draws from the considerable experience of its predecessor, Nomiki Bibliothiki; since 2000, the latter has hosted in its premises hundreds of national and international arbitral proceedings with the participation of leading law firms and the largest enterprises per industry from Greece and abroad. EODID Athens brings this experience a step further and offers comprehensive alternative dispute resolution support services. Interested parties may file a dispute resolution request with regard to any dispute eligible for mediation or arbitration. EODID Athens will then take all necessary steps towards a prompt, cost-effective and efficient resolution thereof. Disputes are better resolved when the resolution initiative comes from those involved. An amicable resolution of the dispute, or at least a resolution method mutually agreed upon, entails more sustainable solutions in the long term, enabling the peaceful co-existence of those involved. 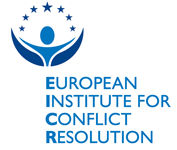 EODID Athens aims at promoting dispute resolution methods which embody the above philosophy. The action of EODID Athens aligns with other initiatives whose purpose is to contribute to an improved system of administration of justice. On the basis of its modern and flexible Arbitration and Mediation Rules, EODID Athens provides dispute resolution services taking into account the interests of all those involved. With a view to providing opportunities for a well-balanced solution for any dispute, EODID Athens operates in the framework established in its Statutes, as detailed in its scope in particular. The Board of Directors of EODID Athens oversees the management and operation of the Organization with regard to all services provided. It is assisted by the Supervisory Board and the Arbitration Board, whose enhanced decision-making powers ensure the integrity, impartiality and independence of EODID Athens. The EODID Supervisory and Arbitration Boards have been constituted by resolution of the Board of Directors. Both the Supervisory and Arbitration Boards operate under their respective Internal Rules. The Mediation Board of EODID Athens is a body composed of prominent jurists – including judges, lawyers and academics – who assist EODID Mediators in their work. The Mediation Board monitors strict adherence to high dispute resolution standards, in particular as regards the rules of conduct that EODID neutrals are expected to abide by when in charge of or participating in mediation cases. The Mediation Board is an independent body whose powers have been established by resolution of the EODID Athens Board of Directors and are set out in detail in the Internal Rules of the Supervisory Board. The Arbitration Committee of EODID is a body composed of distinguished jurists and experienced arbitration professionals. It has a consultative function for the enhancement of the arbitration services provided by EODID. The Arbitration Committee is an independed body whose powers have been established by resolution of the EODID Athens Board of Directors and are set out in detail in the Internal Rules of the Arbitration Committee. The Arbitration Board of EODID Athens is responsible for any action requiring the participation of an independent body to ensure the progress of the arbitration process, without prejudice to the jurisdiction of the arbitral tribunal. The powers of the Arbitration Board are set out in its Internal Rules, as enacted by resolution of the EODID Athens Board of Directors. Providing guidance on the interpretation of the EODID Arbitration Rules, where appropriate.